Disclosure: Our family was provided tickets to Wet 'n' Wild to help facilitate this post. 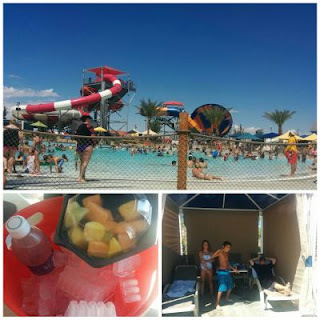 If you haven't yet been to Wet n' Wild Las Vegas, you're missing out! Last weekend we had the opportunity to visit and I'll have to admit, I think it was one of the most relaxing and enjoyable weekends I have had all summer! I honestly have been putting off a trip there all summer, mainly because what I thought I would see, which in fact it was the total opposite. I expected tons of unruly kids running around along with teens running the park. Boy, was I wrong! I was really impressed of the layout as well as the crowd. In fact, I would say it was mostly families that were at the park, which was really enjoyable to see, especially here in Vegas. I do want to share a couple tips. First, get there early! Don't wait to go on the rides like we did, the later it gets, the longer the lines get. Get there when they open and hit the rides so that the rest of the day you can relax and just get some sun! They do have food in the park, reasonably priced. I think we spent around $60 for the day on food and drinks and we are a family of four. Don't get the burger, it was really dry and no good. The kids loved the pizza and I thought the chicken tenders were hoof the hook! They give you a large amount of food too! There is also a hidden gem, a food cart in the middle of the park, which we did not find until after we had lunch, but ordered anyway because it looked and smelled amazing! There is guy with a little set up in the middle of the park. He makes rice along with Hawaiian food. Oh my, it was so good! We were sad we did not find this place before hand. Highly recommend him! They also have free water throughout the park as well as sunscreen stations to help prevent you from getting burnt. Oh - and get a cabana, def worth it! As soon as we got there, they brought us a bucket of ice, some waters and a small bowl of fresh fruit. It was nice to have the covered and reserved shade when needed without having to worry about losing our seats! This weekend Wet 'n' Wild Las Vegas brings, Nathan Sykes and Little Mix performances to Las Vegas' Summer Playground. Tonight, rocker Nathan Sykes will perform at the Red Rock Bay wave pool. Sykes will preform three songs and host a meet and greet prior to the preformance. The exclusive backstage experience will be for winners chosen from social media and radio contests. The concert is presented in partnership with 93.1 The Party. Tomorrow at 5pm, Saturday, Aug. 8th, pop icons Little Mix will be performing at the Red Rock Bay wave pool. The group will perform two songs and host a meet and greet prior to the performance. The exclusive backstage experience will be for winners chosen from a radio contest. The concert is presented with 98.5 KLUC.